This bundle deal is for the complete PARD NV007 package complete with a single QR scope bayonet, plus an 850nm high performance Black Sun Dark Engine laser IR illuminator. IR batteries, charger and mounts should be ordered separately if required. 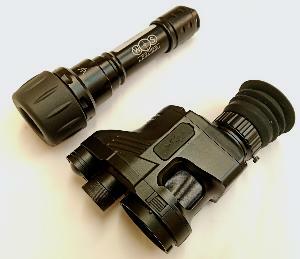 Our BSDE Black Sun Dark Engine IR illuminator supplied in this bundle is our latest evolution of the Black Sun system.